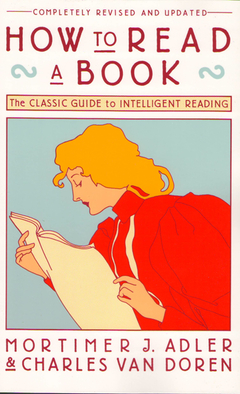 Analytical reading is the fourth part in my series on ways to improve our reading skills. The first rule of analytical reading is that you must know what kind of book you are reading. Are you reading a novel, a play, or is it some sort of expository work – a book that conveys knowledge? This sounds simple but it’s not. For example, is Philip Roth’s Portnoy’s Complaint a work of fiction or a psychoanalytical study? Is Gone with the Wind a romance or history of the south? Any book that consists primarily of opinions, theories, hypotheses, or speculations, for which the claim is made more or less explicitly that they are true in some sense, conveys knowledge in this meaning of knowledge and is an expository work. The goal is more nuanced than distinguishing fiction from nonfiction, because there are various kinds of expository books. It is not merely a question of knowing which books are primarily instructive, but also which are instructive in a particular way. The kinds of information or enlightenment that a history and a philosophical work afford are not the same. The problems dealt with by a book on physics and one on morals are not the same, nor are the methods the writers employ in solving such different problems. The best way to do this is through inspectional reading. One of the things we need to focus on is the distinction between practical and theoretical works. While we all use these words not all of us understand the meaning. The practical has to do with what works in some way, at once or in the long run. The theoretical concerns something to be seen or understood. If we polish the rough truth that is here being grasped, we come to the distinction between knowledge and action as the two ends a writer may have in mind. But, you may say, in dealing with expository books, are we not dealing with books that convey knowledge? How does action come into it? The answer, of course, is that intelligent action depends on knowledge. Books only interested in conveying knowledge itself limit themselves to one type of communication and leave the rest to others. Others, it can be said, have an interest beyond knowledge for the sake of knowledge and concern themselves with problems that knowledge can solve. Making knowledge useful involves the transformation of knowing that and knowing how. Theoretical books teach you that something is the case. Practical books teach you how to do something you want to do or think you should do. Practical books will tell you how something should be done along with an argument for the right way of doing something. A theoretical book, in contrast, will argue that something “is” true. Every book has structure. This leads us to the second and third rules for analytical reading. The second rule of analytical reading is state the unity of the whole book in a single sentence, or at most a few sentences (a short paragraph). This means that you must say what the whole book is about as briefly as possible. The third rule is to set forth the major parts of the book, and show how these are organized into a whole, by being ordered to one another and to the unity of the whole. The reason for this rule should be obvious. If a work of art were absolutely simple, it would, of course, have no parts. But that is never the case. None of the sensible, physical things man knows is simple in this absolute way, nor is any human production. They are all complex unities. You have not grasped a complex unity if all you know about it is how it is one. You must also know how it is many, not a many that consists of a lot of separate things, but an organized many. There is a difference between a heap of bricks, on the one hand, and the single house they can constitute, on the other. There is a difference between a single house and a collection of houses. A book is like a single house. It is a mansion having many rooms, rooms on different levels, of different sizes and shapes, with different outlooks, with different uses. The rooms are independent, in part. Each has its own structure and interior decoration. But they are not absolutely independent and separate. They are connected by doors and arches, by corridors and stairways, by what architects call a “traffic pattern.” Because they are connected, the partial function that each performs contributes its share to the usefulness of the whole house. Otherwise the house would not be livable. The analogy is almost perfect. A good book, like a good house, is an orderly arrangement of parts. Each major part has a certain amount of independence. … As houses are more or less livable, so books are more or less readable. The best books, Adler argues, are those that have the most intelligible structure. Though they are usually more complex than poorer books, their greater complexity is also a greater simplicity, because their parts are better organized, more unified. How important is it to determine the structure of a book? We think very important. Another way of saying this is to say that Rule 2— the requirement that you state the unity of a book— cannot be effectively followed without obeying Rule 3— the requirement that you state the parts that make up that unity. A very simple example will show what we mean. A two-year-old child, just having begun to talk, might say that “two plus two is four.” Objectively, this is a true statement; but we would be wrong to conclude from it that the child knew much mathematics. In fact, the child probably would not know what the statement meant, and so, although the statement by itself was adequate, we would have to say that the child still needed training in the subject. Similarly, you might be right in your guess about a book’s main theme or point, but you still need to go through the exercise of showing how and why you stated it as you did. If these rules seem like they could also apply to writing, they can. “Writing and reading are reciprocal, as are teaching and being taught.” While the rules can work for both, the roles are not the same. Readers try to uncover the skeleton of the book. The author starts with the skeleton and covers it up, say, by putting meat around the bones. The fourth rule of analytical reading is to find out what the authors problems were. The author of a book starts with a question or a set of questions. The book ostensibly contains the answer or answers. The writer may or may not tell you what the questions were as well as give you the answers that are the fruits of his work. Whether he does or does not, and especially if he does not, it is your task as a reader to formulate the questions as precisely as you can. You should be able to state the main question that the book tries to answer, and you should be able to state the subordinate questions if the main question is complex and has many parts. This doesn’t mean you need to go into what the critics call, the intentional fallacy. That is, thinking that you can discover what the author was thinking as he wrote the book. Commonly this applies to literary works. An example of this would be trying to psychoanalyze Shakespeare from Hamlet. There is a big difference between trying to figure out what questions the author set out to answer and trying to determine what they were thinking at the time of writing. How do you Find What a Book is About? 1. Classify the book according to kind and subject matter. 4. Define the problem or problems the author is trying to solve. While there are four levels to reading — the fourth being syntopical reading — I’m stopping here. If I’ve whetted your appetite to learn more, you should read the book.